An oily face can cause a great deal of embarrassment and stress especially through the teen years. Our complexion is kept healthy when normal amounts of sebum is naturally produced by the sebaceous glands (oil glands) to keep it moisturized and protected from the environment. An excess amount of oil can cause numerous problems, often leading to acne. An excess of oil can also cause the complexion to appear greasy and dull and create makeup issues. Application of any type of cosmetic or foundation can be difficult and will often wind up looking blotchy, uneven and quick to fade. The problems of oily skin on face, blemishes, black heads, clogged pores, severe redness, pitting and scarring can often excel throughout teen years although, oiliness can also come from many other sources such as heredity, hormones, environment, food allergies, stress, improper skin care, and aggravating cosmetics. Since this is a very common skin type, many individuals are seeking out effective ways to manage “Too much shine”. Fortunately, some of these causes are within your ability to control with a few simple methods. You can minimize the oily face effects by properly treating your complexion by following a consistent facial regimen with quality products designed for your skin type. You can also add some healthy treatment recipes that can help you control, soothe and heal this condition. Natural home remedies are low-cost, effective and free of chemicals, perfumes, and other harsh ingredients. Warning: Use caution when following these recipes. Always test for allergic reaction to ingredients. Milk Face Wash - Milk alone is an excellent oil-free cleanser. It can also be mixed with essential oils (2-3 drops) such as lavender, tea tree, or sandlewood or a paste can be made by adding almond meal (ground almonds) and lemon juice (astringent) to help clean embedded dirt and makeup. Gently massage the face with mixture – rinse well with cold water. Apple Cider Vinegar -Apple cider vinegar (contains acetic acid) used as a facial toner can help exfoliate and reduce excessive oil. After washing your face, dampen a cotton ball or pad in vinegar and apply over your face. Equal parts of rose water and cucumber juice can also be used as a facial toner. Tomato Mask -Tomatoes help dry up oil (naturally acidic) and lighten pigmentation problems(contain Vitamin C). Remove skin. Mash up ripe tomato pulp and leave the puree on your face for 15 to 20 minutes. Rinse with lukewarm water. Egg White & Honey Mask -Mix 1 Tbsp. of pure honey (nourishing) to one beaten egg white (firms and soaks up oil.) Apply mixture to your face. Leave on 20 minutes and rinse with lukewarm water. Mix ingredients together and apply to face. Leave on for 15-20 minutes and wash off with lukewarm water. Aloe Vera -Aloe is very effective in absorbing oil and known for its anti-inflammatory properties. Apply Aloe Vera gel topically, as needed to your face to absorb oil, clear pores and give a refreshing appearance. Aloe can also be used to make a scrub- Example – Make a paste with almond meal. Apply to face, massage lightly, then wash off thoroughly. 2 Tbsp plain Yogurt 2 Tbsp. Aloe Vera Gel 1 tsp. Witch Hazel (anti-inflammatory, reduce excess oil and tighten pores) 1 tsp fresh Lemon juice Combine all ingredients and blend well. Apply to face-leave for 20 minutes, rinse well. Facial Steamer Treatment –A facial steam spa treatment you can give yourself at home is an excellent way to open and clear clogged pores and remove impurities from your complexion. It will heal oily face blemishes and rejuvenate your skin. Bring a pan of water to a boil. Lean your head directly over the bowl and drape a towel over your head to keep the steam from escaping. Relax and steam your face for 5-7 minutes. Splash with cool water to seal pores. Optional- add a few drops essential oil to the water such as peppermint or lemongrass. Cedarwood – Astringent- Purifying and calming properties helps regulate sebaceous gland activity. Cypress -Its antiseptic and astringent properties make it effective for balancing and controlling infections and acne outbreaks. Helps promote cellular regeneration. Geranium –Astringent-Helps re-balance congested skin, reducing inflammation. Sandalwood -A very soothing and strengthening oil, contains antiseptic properties to help control bacteria, is excellent for acne, and works to reduce excessive sebum production. Lemon -Fragrant- powerful astringent and antiseptic. Lemon oil also has uplifting, purifying, and rejuvenating properties. Lavender –Well known for its very soothing properties. Powerful regenerative oil, Antibacterial. Tea Tree Oil -Powerful antibacterial and antiseptic. It helps soothe irritations, rashes and burns, excellent for acne conditions. Medicine cabinet “must have” spot treatment. Rosewood -The antiseptic, bactericidal, and comforting properties of this oil helps reduce sebum production. Ylang Ylang - Helps balance and calm the skin’ oil production. Others include but are not limited to: Frankincense, Patchouli, Bergamot, Clary sage, Lemon grass, Clove, and Chamomile. A weekly face mask can help control excess oil. Clay or mud-based masks help to draw out and absorb the oil on your face. Honey Oatmeal Mask -An oatmeal and honey mask can be very effective for treating excessively oily skin. Oatmeal is a gentle exfoliant, leaving skin soft. Honey adds moisture and nutrients. Simply make a paste using 1 Tablespoon uncooked, fine-ground oatmeal, water, 1 teaspoon honey, and 1 teaspoon lemon juice. Spread this mixture on your face and leave the mask on for about 15-20 minutes, and rinse it off with warm water. 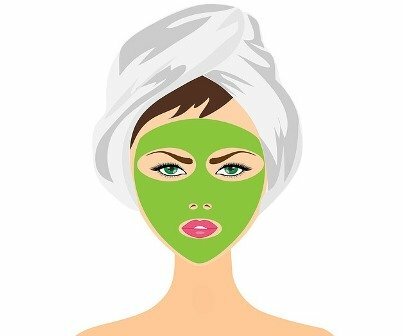 Cucumber Mask - Mix together 2 tbsp. of grated cucumber flesh into 1 beaten egg white. Add 1 teaspoon mint. Chill. Apply this soothing mixture mask to face. Leave on for 15-20 minutes. Rinse off with warm water. Oatmeal Egg Mask - Blend ½ C cooked Oatmeal, 1 Egg White, 1 Tbsp Lemon juice and ½ C mashed Apple into a smooth paste. Apply this paste on your face for 15-20 minutes. Rinse with luke-warm water. Egg white helps tone and draw out excess oil. The acids in the apple help exfoliation. Basic Green Clay Mask - Clay masks are soothing and healing to skin. They help draw out toxins, dirt and excess sebum. Optional: Few drops of your favorite essential oil. Leave on for 15-20 minutes and rinse of with lukewarm water. Puree together in blender equal parts of Apple and fresh Pumpkin slice (peeled and cored.) Apple and pumpkin help exfoliate and purify. Apply to face. Leave on for 15-20 minutes. Rinse off with tepid water. On the plus side- Oil production decreases with age. With age, skin starts to wrinkle. Over time, people with oily skin tend to wrinkle less and are less prone to deep lines and furrows.